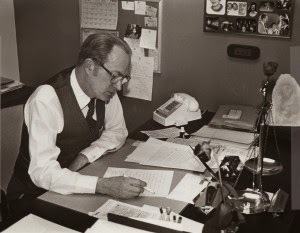 John C. Willke in his National Right to Life office, circa 1982. Willke's rhetoric could exhibit some of the more hysterical tendencies of the pro-life movement. In one letter to supporters, for example, he alleged that abortionists were harvesting and selling organs from fetuses. The information was based on an anecdote from one anonymous source, but Willke relayed it as verified truth. "These are real baby parts," he wrote, "often from live born babies who have been delivered by Partial-Birth abortion … Now we know why the abortion industry has a vested interest in keeping partial birth abortions legal. They need this grisly procedure so they can get intact bodies in order to harvest and sell the body parts of babies they kill." He hoped the horror of late-term abortions would spark moral outrage in those who would rather not think about the details of abortion. Willke said this tactic had worked with the political issue of slavery in 1850s Ohio when the Fugitive Slave Act, which allowed slavers to re-capture escaped slaves in the North and then march them back to slavery, brought the horror of the practice into plain sight, and shocked many who had been content not knowing about it before. "This rubbed it in the faces of good people," Willke said. "Not long after that, the whole thing exploded." Read the whole obit for John C. "Jack" Willke, a doctor who led and shaped the pro-life movement, at Religion Dispatches.